Instead of exchanging Christmas gifts this year, we decided to go on a trip. The main reason this came about was due to a small inheritance my sisters and I received when our Uncle Bob passed away a year and a half ago. We had talked about doing a family trip for awhile and since we figured we all had the money to go right now, we decided to go for it. Originally we had talked about doing a more extravagant trip like a cruise or an all-inclusive. But with the two babies in our family we decided to keep it a little more simple just in case. So we decided on Texas! We spent a couple days in San Antonio and then a couple days on the beach in Corpus Christi. We took a lot of pictures so there will be a lot of blog posts. Here's day 1. Day 1 is travel day. Our family headed down from Wichita to San Antonio on Friday, Dec 17th. We stopped at a place for "The Best Burgers in TX." 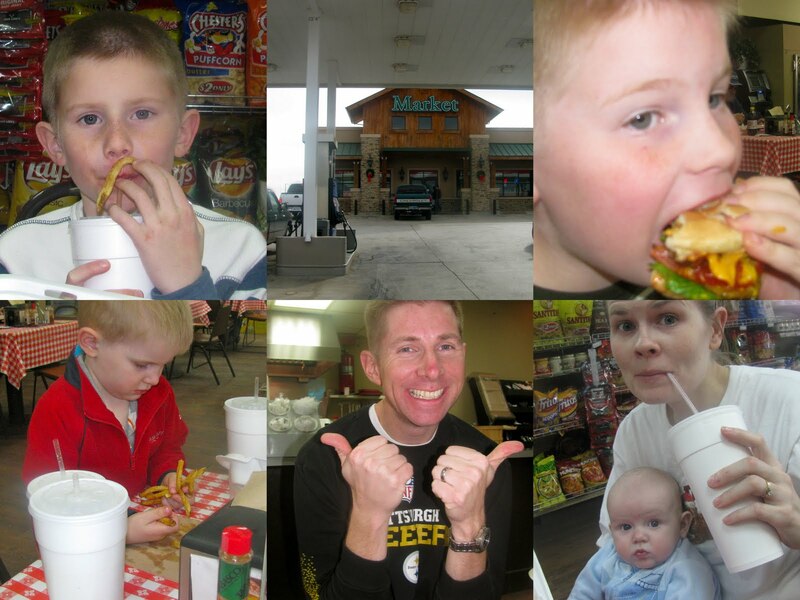 Little did we know that it was inside a gas station but they were quite yummy and we could refuel all in one stop! As we traveled down to San Antonio, we also stopped to visit our niece, Amanda and her family in Georgetown. We have not seen them in a year so it was nice to have a little visit with them. They even bought us pizza which was fantastic! Unfortunately I didn't take any pictures! Finally we made it to San Antonio and hung out with the family a little bit before going to bed.